It’s industry dependent. The brands which experience the most success with social media seem to specialize in providing high quality, professional information (e.g. multimedia), or entertainment and recreation, rather than products or services. In summary, I’ve often felt social media is disproportionately emphasized, in marketing and journalistic circles at least, relative to its impact. Perhaps this is because it’s accessible and marketers and journalists enjoy using social media, or perhaps it receives disproportionate attention because journalists and other public personalities, as well as marketers, are more active on social media than the average person. For these reasons and more, we wanted to gain more insight on how well brands perform on social media. To do this, we pulled publicly available data on the world’s top 100 brands e.g. Netflix, Tesla, Adidas, Disney, etc., from Facebook’s API. Our key findings are outlined below, alongside supplementary research. To be clear, I’m not dismissing social media as a marketing or communications tactic. In fact, in some cases I think it can prove tremendously useful (particularly if you’re a PR professional or a journalist). Moreover, if you create high quality, professional content, it’s likely to have a positive, albeit indirect, effect on marketing performance across other channels (e.g. acquiring links, brand awareness, etc.). However, such effects are far more difficult to quantify and whether you choose to utilize social media should be, like any tactic you choose to utilize, dependent on whether you need to demonstrate a ROI (as is the case for many organizations with restrictive marketing budgets), and your strategic priorities i.e. it shouldn’t be treated as something brands do by default. Of the world’s top 100 brands (as pulled from Interbrand), only two (Tesla and Apple) don’t maintain an active Facebook presence, and one of those brands (Tesla) only recently deleted its page. With some of the world’s biggest advertisers e.g. Procter & Gamble, Unilever, etc., re-evaluating social media or cutting digital marketing budgets owed to brand security concerns, poor performance or inconsistent metrics, it’s more important than ever to determine why you’re using social media, how effective it is and whether there are more appropriate tactics for reaching your target audience (either online or offline). Do people use social media to interact with brands? According to a Forrester study from 2015, the average engagement rate for the world’s top 50 brands on Facebook was 0.22 percent. 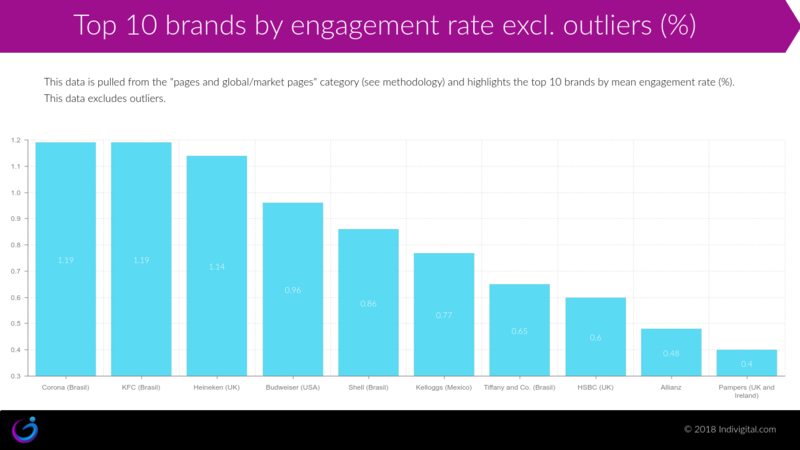 According to our research for 2018, the average engagement rate (mean) for the world’s top 100 brands is 0.12 percent including outliers and 0.10 percent excluding outliers. The median average engagement rate for these brands on Facebook is 0.02 percent. In our study, an engagement is defined as a post like, comment, share or reaction. 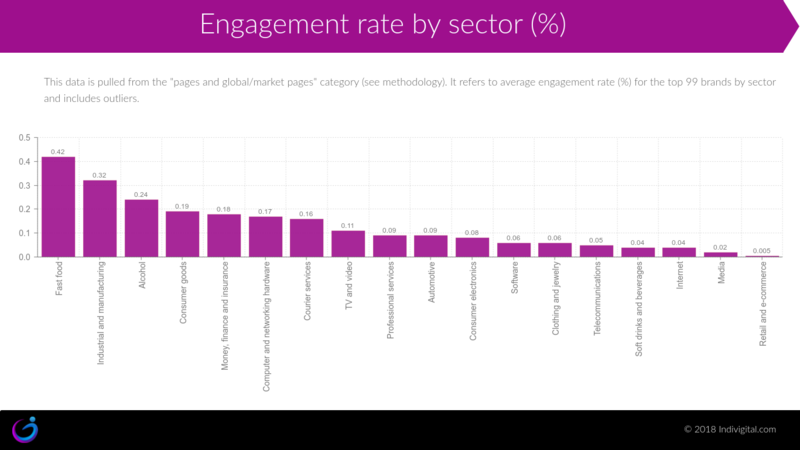 At 1.19 percent, the Corona Brazil page had the best engagement rate (mean) overall (when we exclude outliers). Citi is the best performing brand when we include outliers and accounts for an average engagement rate (mean) of 2.61 percent (a small number of Citi’s posts attracted engagement rates north of 10 percent – this highest was over 50 percent – and these posts were identified as outliers). Of the 29,047 posts we analysed between March 2017 and March 2018, 72 percent of posts received between 0-100 shares, 84 percent of posts received between 0-100 comments, 34 percent of posts received between 0-100 likes and 72 percent of posts received between 0-100 reactions. The Netflix US page was the best performer for both comments (1.7 million) and shares (4.1 million), while the Discovery page was the best performer for total post likes excluding outliers (7.3 million posts likes) and the Lenovo page was the best performer for total post likes including outliers (13.4 million post likes). 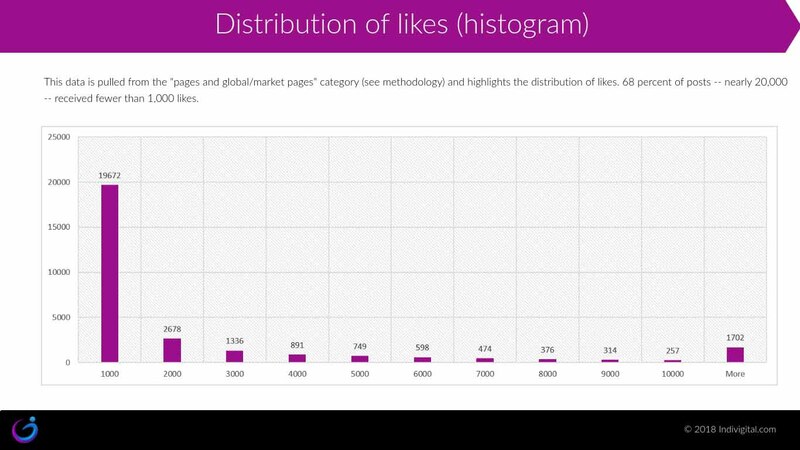 The histogram posted below also details the distribution of post likes across all 100 brands. 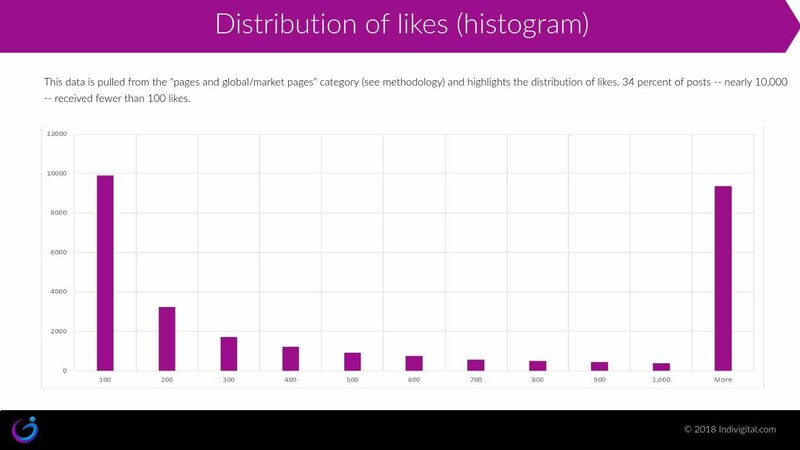 We also created a histogram to show the distribution of post likes in increments of 1,000. 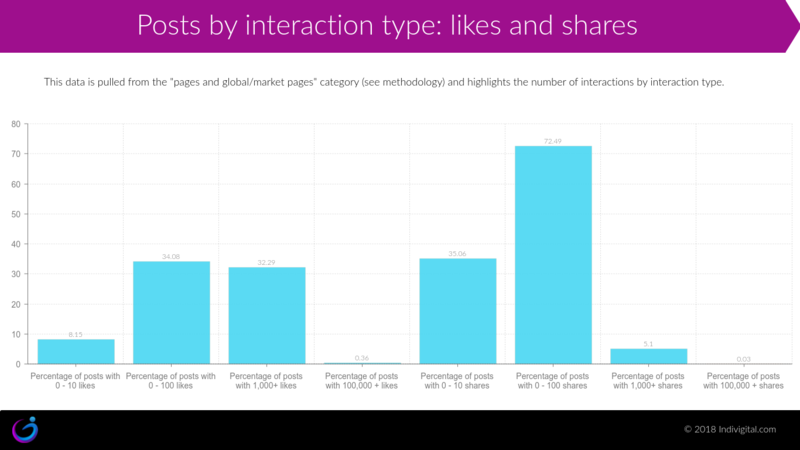 According to the graph above, 68 percent of posts received between 0-1,000 likes, while only 6 percent of posts received more than 10,000 likes. When evaluating the effectiveness of social media as a marketing or communications channel, it’s also important to address why people use social media. According to Australian-based research organization Sensis, 89 percent of users utilize social media to “catch-up with family and friends” (this is by some distance the most popular activity) while only 18 percent use it to “follow or find out about particular brands or businesses”. 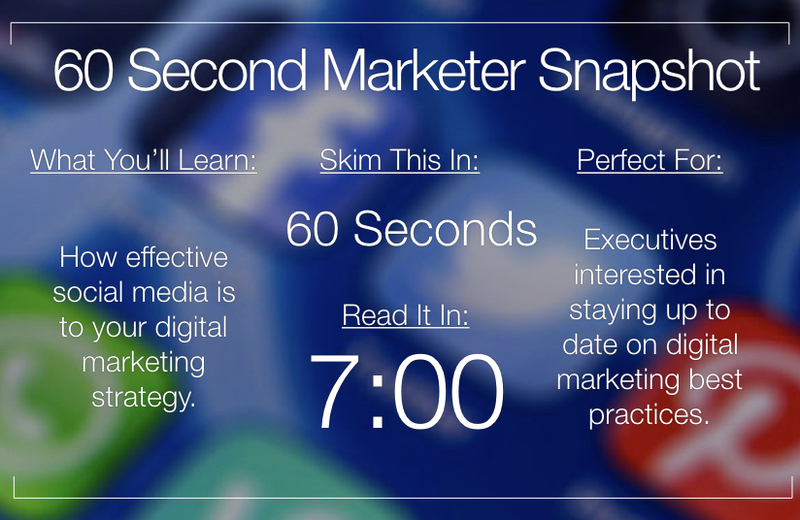 Marketers spend a lot of time on social media…is it time well spent? According to a recent survey of nearly 1,000 social media professionals by Simply Measured, 61.4 percent of respondents identified measuring ROI of social media as one of their top three challenges. The second most common challenge cited, as selected by 35.5 percent of respondents, is “tying social [media] to business goals”. Despite this, and according to a survey from 2015 (PDF), 64 percent of marketers use social media for six hours or more every week, while 41 percent of marketers use it for more than eleven hours per week. Is it justifiable to spend this much time on a tactic marketers struggle to attribute? Then again, perhaps the desire to make ROI directly attributable to marketing campaigns is a demand unfairly reserved for digital channels. After all, digital channels enjoy the benefits and features of digital analytics platforms, and it would be at best more difficult, and at worst next to impossible, to directly attribute sales to offline creative. Aside from marketers, it’s also clear journalists are one of the most active groups on social media. According to a study from Triggertrap published on Medium.com in 2015, journalists account for 24.6 percent of all verified users (which is the largest share of any group analyzed). The report also isolates media organizations, businesses and journalists as the groups which send the most tweets. Jack Dorsey, Twitter’s CEO, also credits journalists with Twitter’s popularity. According to analysis of 87 million website sessions and €230 million in online revenue by Wolfgang Digital in 2016 (PDF), Google organic search contributes 41 percent of all e-commerce revenue and is the biggest revenue contributor for e-commerce websites. Facebook organic is the biggest social media contributor despite only accounting for 2 percent of all e-commerce revenue. According to SimilarWeb.com, social media contributes 6 percent of Amazon’s traffic, 3 percent of BestBuy’s traffic, 5 percent of Apple’s traffic, 4 percent of eBay’s traffic and 7 percent of ASOS’s traffic. The average (mean) organic search traffic contribution to the brands above is 37 percent. According to our research of the top 100 brands, general e-commerce brands were the worst performers overall, with an average Facebook engagement rate of 0.005 percent. Amazon’s engagement rate on Facebook between March 2017 and March 2018 was 0.004 percent. Of the top 100 brands, only Amazon, eBay and Ikea were placed in our “retail and e-commerce” category, largely because the number of clothing and jewelry brands in the top 100 necessitated a separate category. The average engagement rate for the clothing and jewelry category is 0.06 percent (“fast food” is the top performer overall, accounting for an engagement rate of 0.42 percent). What are some of the other key findings from our research? The video post type performed best overall accounting for 53.5 percent of total interactions excluding outliers and 46.6 percent of total interactions including outliers. Brands with between 300,000 and 1 million fans performed best overall, accounting for an average engagement rate of 0.22 percent. 60 percent of the top 100 brands had implemented global pages. 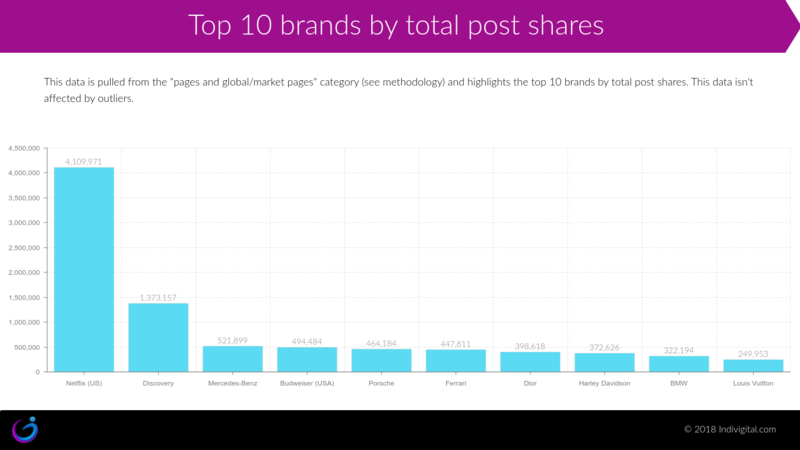 The 13 brands with fewer than 50 posts over the time frame analyzed performed best overall with an average engagement rate (mean) of 0.42 percent. You can read the full report here (PDF, 3.8MB). To retrieve accurate engagement rate totals, we had to adjust page like totals for brands which had implemented Facebook’s global page likes feature. We did this by selecting a single, representative market page for each brand which implemented global pages. We then analyzed the number of post likes from the target audience to this page. Outliers were identified by analyzing total post shares as a percentage of total post likes for data which lived three standard deviations beyond the mean. You can read more about the methodology here. Is social media still worth it? Social media isn’t a panacea. From our analysis, it was evident certain sectors performed well on social media and other less so. Overall, all sectors struggled to produce meaningful engagement rates, and brands across the board seem to struggle to drive referral traffic from social media websites. Social media is fundamentally a social medium. Brands could benefit more from social media if they focused less on promoting products and services, or self-promotional communications, and more on its indirect benefits e.g. building relationships within influential communities which are particularly active on social platforms (journalists and media corporations). Interactions aren’t evenly distributed. If you’re tempted into pursuing social media based on observing viral content, then don’t be. Most content on social media receives relatively few interactions and posts which receive very high engagement rates are the exception to the rule (e.g. of 29,047 posts analyzed, only one post received more than 100,000 reactions or comments, while only 105 posts received more than 100,000 likes). By all means leverage social media as part of your marketing mix, however it’s more important than ever to see beyond the big outliers and consider the type of person who frequents social media. About the Author: Jason is co-founder of Indivigital, a tech and marketing news and product reviews website. His content has been syndicated to, published on, or linked to from, a range of websites including SEMrush, Yahoo, MediaPost and Smart Insights. You can follow him on Twitter here.